NEW ORLEANS, L.A., May 4, 2015 – House Beautiful’s “Kitchen of the Year” has been a source of “dream kitchen” inspiration since it debuted in 2008 in New York City’s famed Rockefeller Center. This year, the tradition comes to New Orleans’ Uptown neighborhood with a twist: for the first time ever, the kitchen is being built inside the home of a real family, with homeowners Helen and Scott Jenkins being the lucky winners selected to receive the renovation. Their historic Italianate residence dates back to the 1860s, and was the feature attraction of the Junior League of New Orleans’ 10th Annual Kitchen Tour, which was open to the public on May 2nd and 3rd. The newly upgraded kitchen is the brainchild of master designer, Ken Fulk. The San Francisco-based Fulk did an impressive job of preserving the historic beauty of the residence while integrating modern elements, such as the four distinctive GROHE products that span across the large-scale kitchen renovation, encompassing a family room and dining area. “We wanted to preserve the sort of rustic, charming feel of this 1860’s space and not turn it into one of those all-white, über modern homogenized kitchens,” advises Fulk. “GROHE has been an important part of bringing a contemporary feel to the space and making it not only beautiful, but highly functional, too.” In addition to these spaces, the designer also utilized GROHE product when remodeling the adjoining parlor room into a library with a full wet bar. “We are especially excited to be a part of this year’s House Beautiful Kitchen of the Year because it serves a private residence in the local community for the first time,” says Cheryl Dixon, U.S. Head of Brand Trade and Marketing for GROHE, the world’s leading single-brand manufacturer and supplier of kitchen and bath fittings “This kitchen is the perfect blend of design, technology, quality and sustainability, and was designed with a real family in mind who will get to enjoy the benefits of these four industry-leading products in their home for years to come. The GROHE Blue Chilled + Sparkling faucet. Fulk took it upon himself to get to know the homeowners and their lifestyle throughout the design process. “The Jenkins love to entertain their many friends and family, there’s always a gaggle of kids running around, dogs and people in and out, and the kitchen was the heartbeat of all this action; where people tended to gather the most, so we expanded the space and reinvigorated the existing parlor to give them even more room,” Fulk continues. 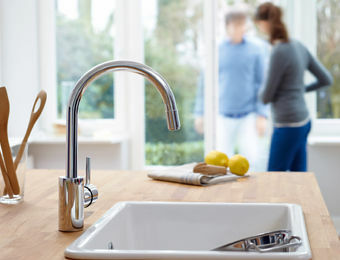 Realizing their love of entertaining and need to satisfy many different water preferences, Fulk offered the Jenkins’ the ultimate in a customized water experience through the award-winning GROHE Blue Chilled + Sparkling faucet, featuring a high-performance filter, cooler, and carbonator that allows users to easily switch between three water settings; filtered still, medium sparkling and full sparkling. This installation is also equipped with a new feature to enhance the already outstanding product: the Active Carbon filter, which removes impurities for an enhanced, premium water taste. In addition to these attributes, it is important to note that the GROHE Blue Chilled + Sparkling faucet can significantly aid in reducing a users’ carbon footprint by eliminating the need to buy bottled still and sparkling water. The GROHE K7® Semi-Pro faucet. 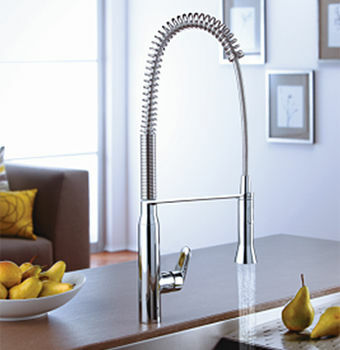 Featured in the kitchen is the professional-grade GROHE K7® Semi-Pro faucet. “K7 blends the functional performance of a professional kitchen with sophisticated design,” Dixon notes.The K7 was designed with cooking enthusiasts and amateur chefs in mind, featuring a flexible pull-out spray as well as the ability to easily switch between two spray options without interrupting water flow. Helen Jenkins and her two daughters are cooking enthusiasts,indeed. “We love to all cook together, we have weekly family dinners, we love to bake for our friends,” she notes. Keeping her active kitchen clean and orderly is especially important during a certain festive time of year. “We are only one street away from a big parade that happens during Mardi Gras, so we pretty much have an open house during that time, we’re non-stop in and out of the kitchen,” she advises. Fulk took this into account, noting that the K7 “makes clean up at the sink practical.” The faucet has a 360°swivel arm, offering full sink accessibility when cleaning and filling tall pots. The GROHE Concetto faucet in GROHE StarLight® Chrome. The GROHE Concetto faucet, also featured in the kitchen, has a dual spray setting and pull-down that offers users superior functionality. Durable ceramic discs provide effortless control of water temperature and volume for a lifetime of maintenance-free operation. “The Concetto faucet is dynamic both in style and function,” says Dixon. Fulk chose the GROHE StarLight® Chrome finish for a classically sleek, polished look. Fulk credits this faucet as being “evergreen,” something that will never go out of style, that is also quality-constructed and can stand up to years of everyday use.  The GROHE pot filler in GROHE RealSteel®. 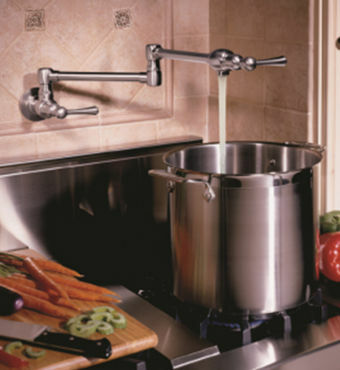 To further enhance the New Orleans kitchen and all of its capabilities, Fulk installed a GROHE pot filler. The dual-pivot joint construction extends 20+ inches for ultimate ease-of-use when filling pots directly over the stove. It also easily glides into a foldaway position after each use. Featured in GROHE RealSteel®, the pot filler has two ¼-turn level handles; one at the source and one at the water outlet, to provide additional safety and convenience. “We did not have a pot filler in our kitchen before, and I’m so happy we do now, it makes such a difference,” says Jenkins. “We often entertain large groups of people, and filling up big pots in the sink is so difficult. Also, my 12-year-old loves pasta, we make it as least once a week, so the pot filler is definitely going to be put to good use,” she continues. “This whole process has been surreal, sometimes I have to stop and ask, ‘is this really my life?’” says an excited Jenkins. Before the remodel, Jenkins said her kitchen space was inconvenient, and guests felt as they were in her way when she had to navigate through them to tend to her cooking. “Now, the space is transformed, not only can we entertain and maximize space in our beautiful renovation, but it’s safe, easy and accessible for the whole family to cook together,” she concludes. In this case, the kitchen has indeed transformed into the new American living room.